Jackie Robinson to Malcolm X. Thousands of NYC streets are named for people. Some are presidents—likely famous ones such as Washington or Lincoln. Often the practice is to develop a group of streets named by category, so in NYC we have flocks of streets named for astronauts, classical composers, NYC mayors, and vestrymen and other early officials at Trinity Church, the center of culture and politics in NYC’s early days. For the sake of simplicity and expediency, when the Manhattan street layout grid was conceived and surveyed beginning in 1811, numbers ruled the day with east-west streets and north-south avenues, and letters A-D in the Lower East Side. Brooklyn embraced the numbers game even more enthusiastically than Manhattan—there are several systems of numbered streets there, including plain un-suffixed numbered streets and avenues in western Brooklyn, East, West, North and South numbered streets, as well as Bay, Beach, Flatlands, Paerdegat etc. numbered flocks of streets, and of course Aves. A-Z, which skips a few letters including the most frequently-used one, E.
The Bronx once shared county-hood with Manhattan and continued its east-west numbering system across the Harlem River, with two north-south avenues, 3rd and Park, making it across the roiling waters. Still, both Brooklyn and the Bronx have vast neighborhoods where there are no numbers at all. 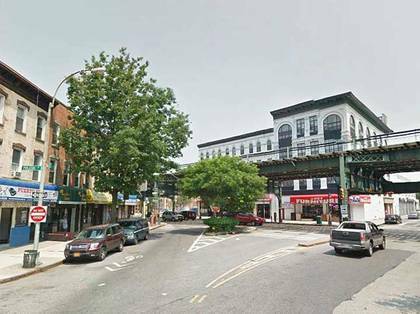 The Queens street nomenclature is simple—one set of numbered streets and avenues, unlike Brooklyn. Again, there are pockets of named streets here and there. Staten Island, which is very unlike the other four boroughs, uses mostly names. But there’s a small club of named streets in NYC that use both their honoree’s first and second names as the only designation. Post-9/11, a growing practice has been to append a name as an addendum under the main name, either on a second street sign, or maddeningly, on the same sign (those Jewel Ave./Harry Van Arsdale, Jr. avenue signs in Flushing are very hard to read). In a former era, however, streets were simply renamed, and businesses had to adjust by printing new letterheads and signage. This is by no means a comprehensive list, but here are some of the more prominent ones, and a few obscure ones. The title photo shows the latest NYC route that was completely changed from one name to another, the Jackie Robinson Parkway. Robinson broke the “color barrier” on April 15, 1947, when he took the field for the Brooklyn Dodgers. Robinson was selected for this responsibility by Brooklyn Dodgers co-owner Branch Rickey after a sterling athletic record at UCLA, where he had lettered in track, football, baseball and basketball. Rickey needed a can’t-miss prospect, as well as a person who would be able to endure the inevitable racial nonsense that would arise in a sport where many players were from the South. Robinson was a five-tool player who hit for average, and power (averaging 16 home runs per year), possessed some speed, and stood out defensively (second base for his early years). Advancing age and diabetes slowed him down in 1956 and 1957; the Dodgers traded him to the Giants, who like the Dodgers were moving to California, but Robinson chose to retire. Robinson passed away in 1972, shortly after addressing a World Series crowd in Cincinnati. He’s interred in Cypress Hills Cemetery, through which passes the parkway later named for him. No borough-wide memorial had been named for him until 1997, when upon the 50th anniversary of his ascension to the Dodgers, New York State designated the entire route of the Interboro Parkway in his name, and replaced all of the parkway’s signage. In 2018, new signs were installed along the parkway featuring Robinson’s likeness. It’s one of the few streets in NYC designated “Highway” (Kings Highway is the longest and most famous). 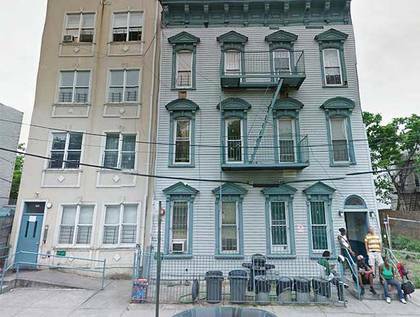 Formerly Boscobel Ave. in University Heights, Bronx, it was renamed in 1945 for another baseball player, but not a New York Yankee. Edward Leslie “Harvard Eddie” Grant played in the major leagues between 1905 and 1915 for the Phils, Reds and New York Giants, hardly a superstar but a workaday infielder. He was killed at Argonnes, France in October 1918, three years after his baseball career ended. Grant was the first major leaguer or ex-major leaguer to die in WWI. In 1921, the Giants dedicated a plaque in the centerfield at the Polo Grounds in his memory; the plaque is duplicated at the Giants’ present home, AT&T Park in San Francisco. 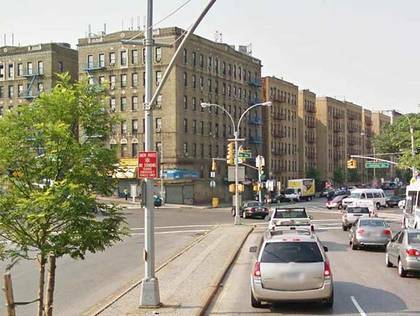 Grant Highway runs northwest from Jerome Ave. and 167th St. to University Ave. (Martin Luther King Blvd.) where it meets Washington Bridge. Asser Levy Pl. runs just two blocks, from E. 23rd to 25th Sts. west of the FDR Drive. For a short street, it’s unusually wide. 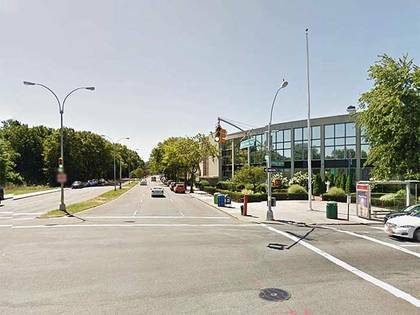 It was originally laid out as part of Ave. A; parts of the avenue run intermittently from the East Village north to Harlem and are known as Ave. A, Asser Levy Pl., Sutton Pl., York Ave., and Pleasant Ave., depending on what part of town you’re in. Asser Levy was one of the first Jews in the New Netherland, arriving from Brazil in the 1650s. The centerpiece of Asser Levy Pl. is a magnificent bathhouse constructed in 1908. In the mid-to late-1800s, NYC’s population increased dramatically in the era before running water and workable plumbing—good hygiene was an unattainable dream and communicable disease ran rampant. Thus arrived the idea of pubic bathhouses; they began to appear in 1901. The 23rd St. Bathhouse (later Asser Levy Bathhouse) was designed by architects Arnold W. Brunner and William Martin Aiken and the design was based on those of Roman baths of the early Anno Domini period. It was honored as a NYC Landmark in 1974. It now serves as a recreation center and swimming pool in the warm months. Probably the largest building in NYC based on a Roman bath was the first Pennsylvania Station that stood from 1910-1963. Asser Levy was one of NYC’s first Jewish settlers. Gov. Peter Stuyvesant tried to bar him from the city militia, but Dutch West India Company directors in Amsterdam upheld Levy. The city renamed this piece of Ave. A for him in 1954. The former Livingston Pl., on the east side of Stuyvesant Sq. from E. 15th to E. 17th Sts., was renamed for Perlman, a Congressman and president of adjoining Beth Israel Hospital (1887-1952). Unlike southern Manhattan’s other large squares like Washington, Union and Madison, Stuyvesant Sq. is bisected by an avenue—2nd (though Robert Moses was thwarted on his plan to connect 5th Ave. and W. Broadway through Washington Square in the 1950s). The square lies on both sides of the avenue between E. 15th and 17th Sts. Many assume that Stuyvesant Sq. was named for the Director General of New Netherland, Peter Stuyvesant, especially since Gertrude Vanderbilt Whitney’s 1941 bronze of Peg Leg Pete is the centerpiece of the park’s western section. However, in 1836, a descendant, Peter Gerard Stuyvesant, the co-founder of the New-York Historical Society, and his wife, Ann Rutherford, decided to “donate” the space, selling it to NYC for $5. 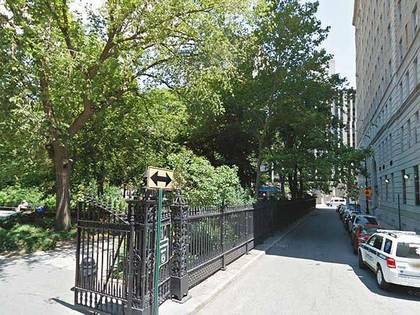 The square was not to open to the public until 1850—in fact, it took a lawsuit by P.G. 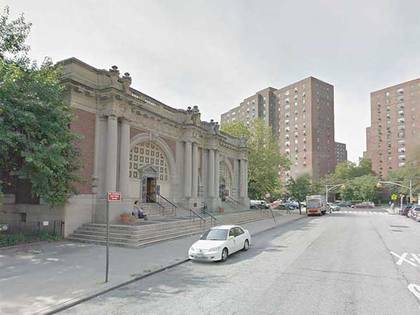 Stuyvesant to get the city to stop dragging its feet on development. Stuyvesant Sq. underwent two large-scale renovations in the 1930s, as part of the Depression-era Works Progress Administration, and again in the 1980s, after decades of the usual neglect. 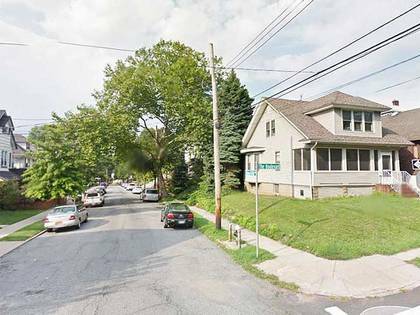 A pair of streets in Westerleigh, Staten Island, are named for prominent figures in the Prohibition movement that started in the late-19th century and eventually resulted in a Constitutional amendment, later reversed, that legally banned the sale and consumption of alcoholic beverages. When Westerleigh was developed in 1887 by the National Prohibition Campground Association, it bore the name Prohibition Park, and its streets were named for prominent figures in the movement, as well as “dry” states that locally banned alcoholic beverages. Fisk (1828-1890), a second Civil War general, was born in upstate Livingston County, NY, though he became a businessman in Coldwater, MI and later, St. Louis, MO. Fisk also ran for president for the Prohibition Party in 1888, losing to Benjamin Harrison. The Prohibition Party is still extant and has fielded a candidate in every presidential election since 1872. Earl Dodge ran for president six times for the party from 1984-2004. Another Westerleigh street, Neal Dow Ave., was named for a Civil War general on the Union side who ran for president on the Prohibition Party ticket in 1880, losing to James Garfield. His mansion is a museum and can be found in his birthplace, Portland, Maine, where he was elected mayor in 1851 and again in 1855. Francis Lewis (1713-1802) was a Welsh merchant who emigrated to Whitestone, then part of Flushing, in 1734. In the 1750s he entered politics, serving as a member of the New York Provincial Congress, and was later elected as a delegate to the NY Continental Congress in 1775. His mansion was destroyed by the British the following year. Lewis was the only signer of the Declaration of Independence from Queens County. In the 1930s, when Cross Island Parkway was under construction, a road named Cross Island Blvd. was renamed Francis Lewis Blvd. The road was extended from Whitestone to Rosedale by renaming a number of previously-existing roads. Morgan Lewis (1754-1844), son of Francis, served in the Revolutionary War and the War of 1812; in between, he was NYDS Attorney General, a State Supreme Court justice, and NYS Governor. Lewis Ave. in Bedford-Stuyvesant, Brooklyn and Lewis St. in Manhattan’s Lower East Side are named for him. It took 20 years before a street was renamed for Malcolm X (né Little), the Nebraskan civil rights leader assassinated in the aftermath of his resignation from the Nation of Islam at the Audubon Ballroom in Harlem in 1965. Reid Ave., named for colonial-era landowner Philip Reid (who’s buried in nearby evergreens Cemetery) was changed to Malcolm X Blvd. in 1985. Soon after, the boulevard was connected to Utica Ave. when traffic engineers created a connection at Fulton St. Elsewhere in NYC, Lenox Ave. was subtitled Malcolm X Blvd. in Harlem, while a brief stretch of 97th St. in East Elmhurst, Queens, his residence just before his death, was subtitled for him. Though there are much longer avenues in NYC sub-named for the great civil rights leader (125th St. in Manhattanville and Harlem and University Ave. in the western Bronx) this is the only street that bears his full name only. It’s a relatively obscure one-block street in eastern Bedford-Stuyvesant. It does have an important distinction: it was the first street in NYC named for King; it was renamed in 1974. The much-longer University Ave. was sub-named for King in the 1970s, but the avenue bears two separate signs. Ironically this Place’s old name, Floyd St., marked the only street in the area named for a signer of the Declaration of Independence from New York, William Floyd (1734-1821). The William Floyd Pkwy. in his adopted home of Brookhaven in Suffolk County will have to suffice. His descendants include guitarist/singer David Crosby and former Massachusetts Governor William Weld; Abraham Lincoln was a distant cousin. —Kevin Walsh is the webmaster of the award-winning website Forgotten NY, and the author of the books Forgotten New York and also, with the Greater Astoria Historical Society Forgotten Queens.